There is nothing more exciting than buying your first home! Our clients made the big purchase with some big renovations in mind. In a previous blog we discussed the bathroom renovation we did for them, and this time it's all about the kitchen! Their kitchen had never been renovated, and I do mean never. It was in need of major update both functionally and aesthetically. Who: L&J - first-time home owners! What: 50's bungalow in the Strathearn neighbourhood. Since the kitchen had such a small footprint, we wanted to make the most of every square inch. There was an unnecessary bulkhead taking up lots of cabinet height, the layout wasn’t well thought out, and there was hardly any counter space. Oh and did I mention there wasn’t a dishwasher! The biggest challenge of this kitchen was the layout. We worked on many many different iterations: from a little movable island, to having a little nook to house the oven, to adding an entire wall of cabinetry that didn't exist before, which was the winning idea. The kitchen was flooded with natural light so we knew that we could do something special, we presented the idea of an all black kitchen. The clients loved it and we ran with it! For the record this is a 6 month pregger belly! 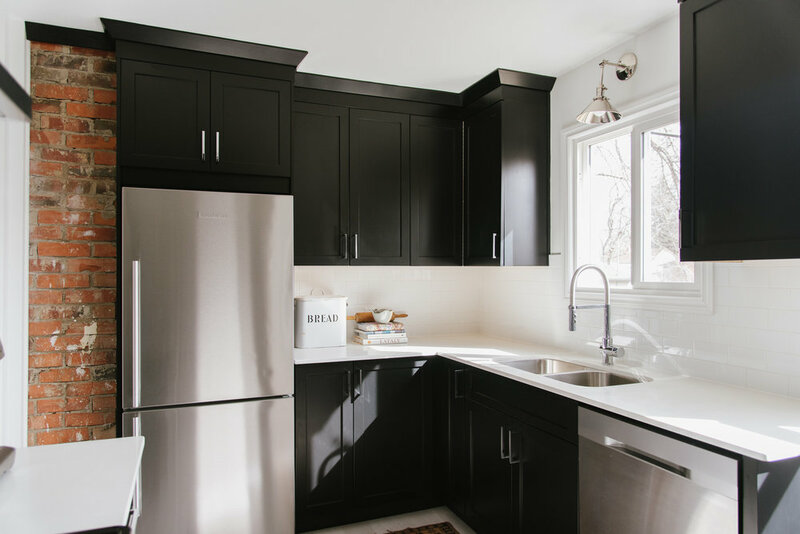 Black cabinets may sounds scary and dark but coupled with so many other bright elements in this room it feels anything but dark. White subway tiles with white grout kept the space feeling bright, its also a timeless look that won’t date quickly. Bright white quartz counters and durable light coloured vinyl floors further keep the space bright. Like every renovation we were keeping a close eye on the budget. The custom cabinets took a big bite out of the budget so we needed to find savings in other places. We opted for a simple 3x6 subway tile backsplash and 3/4" thick quartz counter, slightly thinner than standard thickness it’s barely noticeable but gave us a little savings. Another budget friendly option were the floors we selected. The floors needing replacing, and there was a very bossy honey wood laminate in the adjacent room, so we didn't want to compete with another wood tone. Our first thought was tile, but tile would be costly as it would require a new sub floor and would cost more to install. The other consideration is that tile can be cold and quite hard underfoot. We ended up choosing marmoleum product from Adura. It didn’t require a new subfloor, installed quickly and feels a bit warmer underfoot. One of my favourite details in this kitchen is the brick chimney, if you look at the before photos you will notice it was hidden behind a cabinet. The cabinet was narrow and pretty useless. After a look in the basement I had a suspicion we might be able to uncover brick and I’m so glad we did! It adds so much warmth and interest to the space. Appliances can add a lot of bulk to a kitchen so it is worth choosing them wisely. For this kitchen we ended up sourcing a fantastic 30" wide counter depth fridge through Bloomberg that didn’t protrude into the room. This may have been a vintage home but our clients wanted a fun choice for the central lighting fixture. We selected this gorgeous light fixture from Illuminate Vintage, along with the pretty polished nickel sconce above the sink. They are made to order so you have the option of choosing your metal finish and your shade. This little kitchen turned into a big success. I am so pleased with the final results, not only does this kitchen look beautiful but it really functions well. We used every square inch and planned out the placement of every utensil. In the end we made a kitchen that used to make our clients frustrated into a space they love to be in. Plum is moving! Here is our story and our new home. We've been keeping a big secret... we are moving to a new home! After 6 amazing years we are growing into a bigger space. For the first time Plum Home and Design will be in one location! One beautiful location that we can't wait to show you! We will be opening in June and we hope you will visit us in our new home. If you know anything about us you will understand why we chose our new location, Oliver Exchange. We will be calling home a heritage building built in 1911. It started life as an early telephone switchboard building, The Edmonton Telephone Exchange and a police station. We loved the building's history had and we kept some of the original details in our new space. The doors to Jenna and Pamela's office doors are original to the building. Our design philosophy has always been about creating spaces that feature homeowners personal stories and history. We followed this philosophy in our new Plum home. We weren't sure how to tell you about the big move and our Plum Team thought it would be fun to share the news with you through a little storytelling. So, here is a personal look into who we are and a bit about our journey. How exciting is this! PLUM team: When and how was Plum brought to life? Pamela:We opened our doors in August of 2012 after spending more than a year planning during each and every lunch hour. Jenna had already started her career in interior design when she came to me with the idea of opening a boutique-style shop that would give her design clients an opportunity to connect with the style and products she loves to use in her design practice. My role in the early days was as a business advisor and mentor for Jenna. My career had been spent in the business world, working with entrepreneurs and I had owned my first business when I was 22 and opened another when Jenna was a child. The opportunity to mentor my daughter in business was not one I wanted to miss. Jenna: When I started toying with the idea of opening a store front my mom was the obvious one to talk to about it. Not only did she have decades of experience but she also had the passion, drive and fearlessness you need to open your own business. PLUM team: Tell us about the growth behind this relocation? Jenna: I'm really excited that finally both our design business and retail store will be completely integrated. Our customers will have the opportunity to shop for custom furniture, rugs and pillows that we create and source for our design clients; and our design staff will be on site to help. We have also expanded our Baby Plum section in a big way; the new section will be larger than our current store with so many new lines! We have expanded in all areas - our vision is to create a boutique style department store featuring local and Canadian made products. Pamela: After 6 years in business we knew what our customers wanted. They wanted more! More products, more variety, more of our antiques which is why we have grown into a space that is so much much larger. Our current store is 530 square feet and our new location will be about 4,000 square feet for our design studio and store. PLUM team: Some people may not know that you are a mother-daughter team. What is your favourite part of working with each other? Pamela: It’s delightful! It’s really easy working together because I know Jenna so well and I understand her. Our husbands often tease that we have our own language. That being said, when we are at work we have a professional relationship. I'm not "mom" I'm Pamela. We have complementary strengths. We respect that we both bring different skills to the table and we have our respective areas to look after. That’s what makes it work so well. Rarely do we disagree on the ultimate goal but we approach it very differently which is always interesting. We have a saying: Jenna is the telescope and Pamela is the microscope. Jenna is always looking ahead and I'm focusing on how we get there. We share a common vision for the company and we trust each other completely so ultimately the path is pretty smooth and we do have a lot of fun. Jenna: My favourite part about working with Pamela is that I get to work with Pamela… I love her as my mother but I also really like her. Obviously there is a mother daughter relationship but there is also deep respect and friendship in our work life. I know working with family can be hard, but I actually find it easy. We are very lucky. PLUM team: What advice would you give to your younger self about starting a business? Pamela: Follow your gut and do it with confidence. When you are immersed in your business, you really do understand your market and you know your customers’ needs. Be fearless, trust that you’re on the right path and believe in what you’re doing. PLUM team: Do you have any advice to share with other women in business? Jenna: I learned early on that I could drive myself crazy comparing myself to others. Measuring my success against theirs. I found the phrase: Comparison is the thief of joy. It is something I carry with me. We are on our own path and that is all that matters. Focus on your own business. On that note I think as women in business it is so important that we support each other, this means remembering that her success is not your failure. By supporting another woman in business you aren't diminishing your success. You are just celebrating another well-earned win! Want to be part of the PLUM family? We are excited about our big move to a new location, with a larger space we need to grow the Plum team and we are looking for passionate, design oriented individuals who want to love where they work! Please email jpryor@plumhomeanddesign.com with a cover letter and resume. Interviews will begin June 11th. To read more on exciting news and updates, sign up to receive our Newsletter! Interview by Veronica Petrola - Content & Community for Plum Home and Design. Laundry Rooms Can Be Pretty Too! When you think "laundry room" - your mind might go to the dingy dark corner of the basement, the closet that contains a stacked washer and dryer, or the boring and bland room that is just never organized. This is about how we to took a boring room to beautiful. It almost makes doing laundry fun! One of our regular design clients asked us to dream up a pretty laundry room with an e-design she could follow on her own. E-design can be ideal for little jobs with limited construction and this one is a perfect example of how a vision can become a design reality. This home was a newly built home so the room started with great bones but lacked character. When you are building a home it is hard to splurge on a laundry room with a long list of expenses. Pretty up a room that is usually not too pretty. Work with existing cabinetry and counters. With every e-design we begin with a suggested floor plan, 3D drawing and moodboard. It helps paint a picture for our client. The wall cabinet was not yet mounted, so we opted to mount it in the middle of the wall which then allowed open shelving on one side, and a much needed bar for hanging clothes on the other. With some relatively easy fixes like a new faucet, pretty hardware, and stunning, self adhesive wallpaper, the space was transformed to somewhere you actually want to be! Since the laundry room was on the top floor, in the same hallway as the bedrooms, we wanted to be sure that even if the door was open, the view was pleasing to the eye. We think we accomplished that goal. What do you think? I'm a big believer in that the sum of the details is what makes a room extraordinary. I believe in investing on those forever-details, and in most rooms, this means window covers. If we are talking about draperies, you must consider your drapery hardware. The poles, the brackets, the finials. Are the details ornate or simple almost to a fault? Are you meant to notice the hardware or is the hardware meant to melt away unnoticed? If you are interested in having your drapery hardware noticed, don't forget about your tie backs! First let's talk function. If your drapery is covering a high traffic door or window, pulling your drapery away is an excellent idea. It will absolutely extend the life of your drapery and save a few dry cleaning bills along the way. Now let's talk about beauty. Tie backs can be stunning! I'm not talking about grannie's tie backs, not brocade swaths of fabric. These days, tie backs can be that bit of added fun or beauty to your windows. I've gathered my fav tie backs for you here! And if you're still in doubt about drapery tie backs, here are some inspiration images that may change your mind! Back in November I shared the kitchen of the Classic Home renovation we designed. The project was so large that I thought it was best to share in bite size pieces! Ta-Dah! Now lets look at the final product! The first order of business for this space was to remove the wall separating the kitchen and dining room. It opened up the space and made it function for this family. It also showered both rooms with the stunning light from the French doors. When we took out the wall between the kitchen and the dining room I really wanted to make sure we didn't end up with an awkward kitchen gable in her formal dining area. And what does every great hostess need? Well a built in bar of course. We continued the kitchen cabinetry into the dining area to create a hidden built in bar. Perfect for serving part guests and to hold all of her beautiful glassware. I repeated the antique mirror from the kitchen in the back of the bar for a cohesive look. Even though our client wanted to open her dining room to the kitchen she still wanted the space to feel formal and elegant. I knew the space needed wallpaper. Deciding on that wallpaper did not come quickly or easily - we looked more than 50+ options from all over the world before finally arriving at this beautiful mural from Anthropologie. Unfortunately it was not available in Canada, but that is when having a designer comes in handy. We found a way! We decided to frame it with trim rather than apply it to the entire upper wall to really make it special and feel like artwork! The design is in the details. The homeowner had purchased the light fixture before the renovation began, so we needed to be able to tie it in to the design, hence the repeated brushed brass accents throughout. The table was a family heirloom and the chairs the client fell in love with right before we started the renos. I love how the black chairs tied in with the graphite in the wallpaper. We were fortunate that our client was prepared to commit to luxurious custom drapery in the dining room. They were an important element in the formality of the space. Yes, they are beautiful but they also are functional, the blackout lining keeps the heat out of the room and keeps the sun off her beautiful table. We added grosgrain ribbon along the edge of the drapes for another little detail. Of course the hardware mattered, so we went with a gorgeous heavy brushed brass with the most amazing tie backs. They will keep her beautiful drapes out of harms way when they are going in and out of the French doors. Such a bold statement with the wallpaper required the elegant foundation of the trim and wainscoting we applied. If you are planning to install wainscotting the key is to plan, plan and plan some more. How will the trim end? How will it tie into doorways and windows. In this room I didn't want to see electrical outlets in the middle of the design so I had them all moved down so we could hide them in the baseboards. In the end we were all thrilled with the result. What do you think? It isn’t often that I agree to renovate a space before I’ve ever seen it or before our clients have the keys. When our client Laura and her partner Jan called and sent photos we knew we could make this space much, much better. This was Laura and her husbands first home together, a charming bungalow in a well established neighbourhood. It had so much going for it but the bathroom wasn’t one of those things. Laura could not stand the space and I didn’t blame her, it was a petite space, but that wasn’t its biggest fault. Bad materials, bad lighting, no storage, old window. You name it- this bathroom had it. We kept the 1950's period of the house in mind by choosing really classic materials like subway and hex tile. We made it a bit more interesting by using a 2” hex tile and matte white subway tiles. Laura had towels and a shower curtain she wanted to work with, since we had kept the rest of the scheme really neutral so we could work with the colour from her existing pieces. As soon as I saw the curtain I knew what fabric we needed for the roman blind. We of course had to present a few options but I love that our client agreed and chose my fav fabric. Budget was key in this bathroom – the basics of a new bathroom can eat up a budget really quickly so we needed to get creative and work with what we had. Enter the Ikea vanity! Every renovation is about give and take but we definitely did not sacrifice style and substance for budget. You know the saying about there being an elephant in the room? Well when our client called us to help her design a new closet, that was the perfect way to describe the existing closet situation. A beautifully appointed industrial loft in the center of downtown had so much working for it... until she introduced us to her bedroom closets! The closet was a poorly designed brown vinyl wallpaper wrapped box. Needless to say- it didn’t float our boat. When is brown vinyl wallpaper a good thing? Pretty bad... right? We started by creating an e-design after asking our client a lot of questions about her wardrobe. How many pairs of jeans does she have? Folded or hung? Workout gear? Functionality is crucial. We turned to the Ikea Pax wardrobe system and a little customization to make our client's dreams come true. These closets sat right across from her bed so they needed to be beautiful and that is just what we created – ta dah! We wanted her closets to be extra special so we customized the doors by cutting out the top panel and installing a beautiful metal detail. We sprayed the metal grates with gold Rustoleum spray to compliment our chosen hardware. Basic white wasn’t going to cut it for our client so the doors were sprayed in the lightest shade of grey. Whether you are doing Ikea kitchen cabinets, dresser or wardrobes; my design tip is to NEVER use the supplied handles or knobs. Changing them out for something different sets a big box purchase apart. For our client we chose beautiful glass knobs from Anthropologie. For added convenience LED motion censored lights were added to each closet. When she opens her doors they illuminate her wardrobe. Let there be light! I’m a big fan of the new drawers from Ikea with a Lucite front. Maybe its the buds on the tree reminding me that spring has finally come knocking but lately everything I source has strong natural elements. If you ask me to source wallpaper today I guarantee I will show you a menagerie complete with peacocks, flamingos and chickadees. Images Via: Architectural Digest, Designer Susan Simonpietri, Caitlin Wilson Design, Style Me Pretty and Luxe Interiors & Design. It's not just me the trend is everywhere - like they say: Birds of a feather flock together. Summer and Gingham go hand in hand. 1- Gingham Oversized Dress- Zara. 2- Gingham Rug- Target. 3- Mini Bucket Bag in Gingham- J Crew. 4- Gingham Romper- Kate Spade. 5- Poleng Gingham Umbrella- CB2. 6-Ralph Lauren Gingham Fabric- Available through Plum. 7- Valencia Gingham Shorts- Club Monaco. 8- Elite Home Gingham Sheet Set- Target. Maybe it's the blanket you put down for a picnic, napkins at the table or a cute gingham tablecloth. Either way this adorable pattern is a fav of mine and I’m seeing it pop up everywhere this season. Did you know that the pattern is over 500 years old? It actually started off as striped. But after the Victorian period when it arrived in North America it became more like the check pattern we see today. It has no right or wrong side since the yarns are dyed and then woven. Traditionally it's lightweight and seen in a blue and white pattern. Lightweight and inexpensive, it’s been used for mocking up couture gowns as well as table and bed linens, but became really popular in the 1960’s. These days it's not just relegated to the table top. I love seeing it in unexpected places. Fun Fact: Did you know Bridget Bardot wore a pink gingham wedding dress? I rounded up a few gingham inspirations that will be impossible to resist. The weather outside is frightful and if ever there was a time to light a fire, when the temperature drops below zero is just the time! What is your favourite hobby to do next to a toasty fire? Comment below! Remember when we launched our nursery and kids room e-designs? Well, we gave away an e-design to a lucky winner and we can finally share it with you! Designing spaces for parents and little ones to enjoy is one of my favorite things to do. I spend so many hours in my nursery and oldest son’s room reading books, rocking them to sleep, and wrestling them into clothes. Since the space is so heavily used, it’s important that it makes me and the boys happy, and that it functions well for all of us. Our client was waiting for the arrival of her second baby, a little girl. Since she already had a crib, change table and chair from her first baby, the focus for us was on the décor. Her first was a boy and this time the room needed to work for a little lady! Here is the final result! With e-designs we give the clients options of items to choose from. The hand – does it feel soft? Would it be soft enough for baby knees to crawl on it? Functionality – Babies are known to make a mess or two, can the rug easily be cleaned? My fav rug at the moment is from Jaipur Living, it is 100% cotton and reversible. Plus the price point is really budget friendly, a 5x8 is $225! It would be lovely in a modern nursery! Don’t forget the artwork! Children take in more than you can imagine. Here is shopping list we provided, including some adorable art! How cute are the baby animals from Minted?! In the end, the client loved the design and is going for the gorgeous modern floral wall covering from Anewall (our personal favourite!) We can’t wait to see photos of the finished room! Interested in getting a nursery e-design for yourself? Start here! Cherry on top? Each nursery e-design comes with a $25 gift card to Baby Plum!